Straight on the heels of my Old-Fashioned Chicken Noodle Soup, it’s another one! 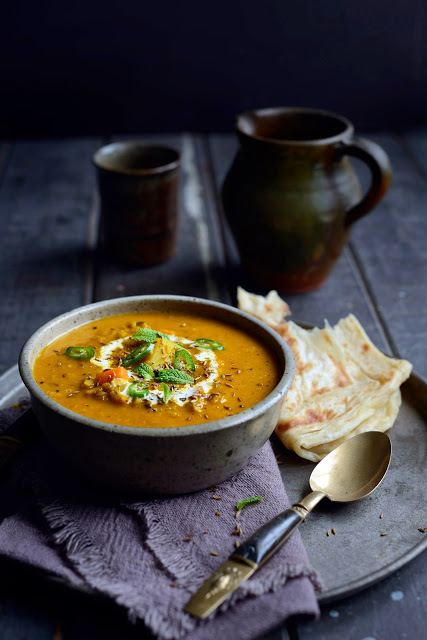 This hearty (yet not heavy) soup is one that I first posted way back in August last year – it had been hanging around in the back of my head for ages, and when I finally posted it, it seemed to hit a note with quite a few of you 🙂 I hope you don’t mind my re-posting it, but I would hate you to have missed it as it is a real favourite. 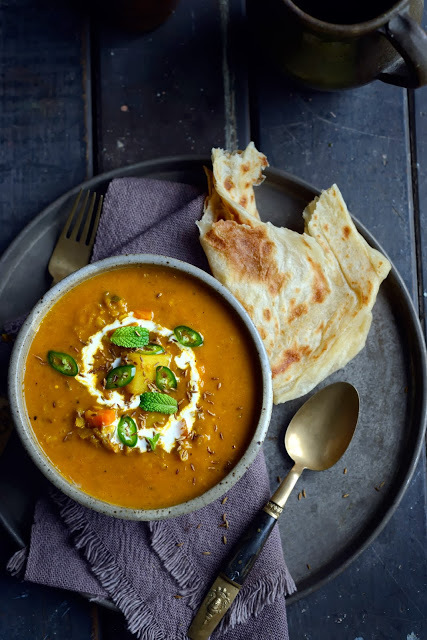 Fragrant with cumin, turmeric, ginger, garam masala and a hint of chilli, it is a fabulously healthy winter treat with a wee bit of naan or roti on the side. The lentils and vegetables pack a fibre punch, and the turmeric is well known for it’s medicinal benefits including anti-inflammatory properties and interestingly for me particularly, possible melanoma-fighting benefits (long story for another day!). The addition of lemon and mint give it a bright note which works well with the mellow curry flavour…anyhoo, I hope you like it, and if you give it a go, be sure and leave me a comment, or come and say ‘hi’ at my Facebook page. Before you go, pop on over to my home page and have a good fossick around my recent posts, hopefully there will be other recipes there that take your fancy! Love this soup. Just before my first baby was due, we made big batches and froze it and it became one of my postpartum staples. Yum! This was phenomenal! A recipe keeper for sure! Very authentic flavors.